Duffy Fainer personally and individually works each event, interacting with the guests and encouraging participation through humor, leadership and a positive attitude. When it's time to dance, he mixes a wide variety of great dance music of over 4000 tunes, to invigorate and energize the audience. He also specializes as a Wedding DJ, having performed at over 1000 weddings over the years. 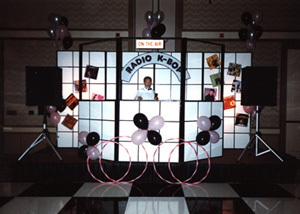 Duffy specializes in many different themes that enhance corporate events and theme parties. The flash and glamour of the disco era are hot right now, and all the great tunes come to life again in this setting. Duffy teaches three disco era line dances, facilitates the "YMCA " with hats and props, makes a John Travolta "Saturday Night Fever" dance contest come alive, and a "name that Disco tune" contest pumps up the night. Adding Video screens featuring memorable moments from the Seventies and music videos can provide multimedia impact. A light show adds realism as we create the complete "disco" environment. Duffy dresses in the complete polyester John Travolta look. Great hits from the sixties, from Niel Sedaka to Steppenwolf...the age of Aquarius comes alive with 60's karaoke tunes the guests can sing to. Dances like the Twist, the Monkey, the Swim, and the Mashed Potato all have their moments. A name that tune contests brings all those favorite tunes right back. Duffy dresses in his patched jean, tie dyed shirt and long haired wig. With over 3000 songs in the collection, everyone can find something to sing...a 15" monitor provides the lyrics for the singers, while the instrumental version of the song plays along. With two mics, a group can back you up, while the audience claps along. Each table gets songbook menus and request slips. This is a great way to pump up any theme party, and can fit in between sets of dance music. It's great for an extra contest on Disco or Sixties nights. Karaoke night alone can be great fun, with contests and prizes to motivate and inspire the audience. With the two big 9x12 ' VIDEO screens, and the latest in MTV type dance videos, plus a high tech "intelligent"lighting system, we can create a very high tech dance environment. The live camera puts the dancing guests up on the big screen, making them the stars of the night. Duffy teaches some contemporary line dances, and keeps the party hopping with all the high tech toys. A fun and casual party that gives the visitor to Southern California, an opportunity to "dance barefoot in the sand", and enjoy the carefree quality of the fabled " Endless Summer". Guests enjoy the music that made California a legend during the 60's, with such artists as, The Beach Boys, Jan and Dean, The Ventures, The Surfaris, and much much more. Duffy recreates the sound and excitement of the period that brings the group to the dance floor and generates maximum response. Features include, Hoola hoop contest,limbo contest, twist contest, "Name that Riff (tune)" music trivia contest, and "Twister". Duffy dresses in Hawaiin shirt and white slacks. All the great hits of the 50's, plus name that tune contests, hoola hoop, limbo, jitterbug dance contest, stroll, hand jive, and bubble gum blowing contest. Karaoke can be added with 50s tunes to sing along with. Duffy dresses in his "bowling team" attire to fit right in..
Plus, "Top Gun" "Biker Bar" "Mad Men"and more.